The historic county of Middlesex is one of the most diverse wedding destinations in the UK. Contained almost entirely within the Greater London area, it boasts every venue you could possibly think of; from swanky bars and golf clubs through to luxury hotels, sprawling manor houses and outdoor spaces – perfectly tailored to boho festival-type weddings. With this kind of variety on offer within the county, we know that every single wedding we provide the music for will be different. That’s why we consult with you prior to your big day and make sure that we select the right DJ for you, as we strive to provide you with a bespoke service, tailored to your exact personal requirements. We pride ourselves on giving you and your partner a musical experience that matches the mood of you wedding day, playing only the music that you want to hear. No song or genre request is too left-field; whatever you would like to hear; it’s no problem. As event specialists, we are also able to offer consultation and advice on the feel and look of your wedding reception. If you are looking for a certain type of lighting effect, specific colours for different parts of the day or night, uplighting or festoon lighting, we can make it happen. We are also able to provide support throughout any section of the day, including but not limited to; sound system support and music for the ceremony, background music for the breakfast and equipment set up in advance of the day. 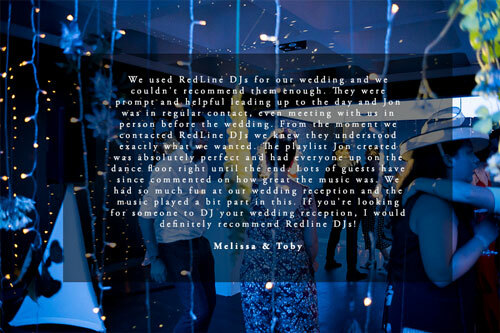 If you’re looking for the very best Wedding DJs Middlesex has to offer, then you are in the right place. Our highly skilled DJs have a vast amount of experience, having soundtracked every kind of wedding imaginable for over ten years. It doesn’t matter if you’re planning a high end, luxe event or something a little more bohemian, our highly experienced team are dedicated to meeting and exceeding your expectations and requirements. Our services are priced competitively but with a strong focus on quality of service. Our DJs are not only trained to provide floor-filling sets but also as emcees and evening reception specialists. We work tirelessly to ensure that we provide you with the highest level of service, both prior to and on the day of your wedding. All of our wedding DJ packages come complete with intelligent ‘moving head’ lighting and a tastefully discreet DJ booth as standard.